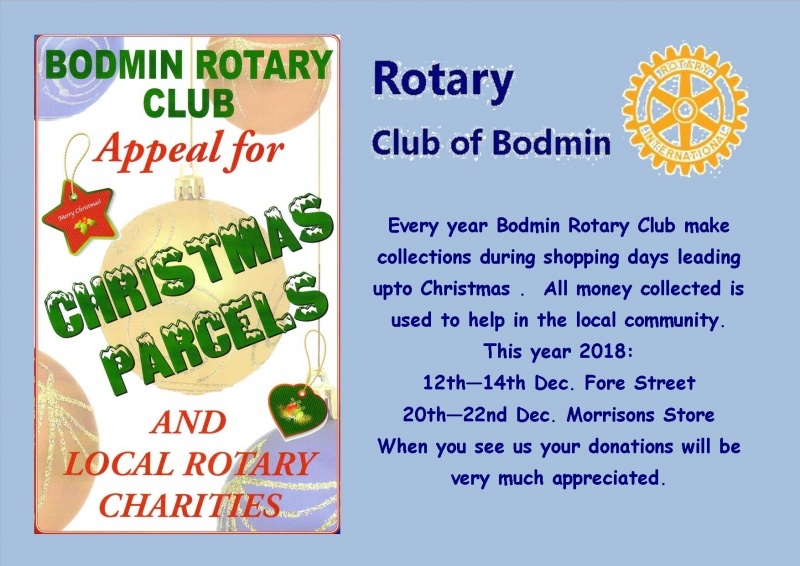 Rotary Club of Bodmin - welcome! Please scroll/swipe down through this page to find out more about us, in addition to the pages linked in the menu, top-left. 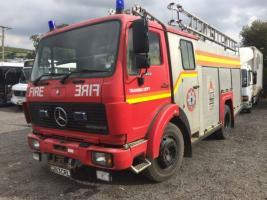 This project is to assist the local Albanian community to have their own functioning fire appliance and training. This will give them better fire cover to preserve their buildings and save lives. Bodmins junior parkrun - Supported by Bodmin Rotary Club and other local organisations is up and 'running' EVERY Sunday Morning at 0900hrs, Berrycoombe Vale, Bodmin. 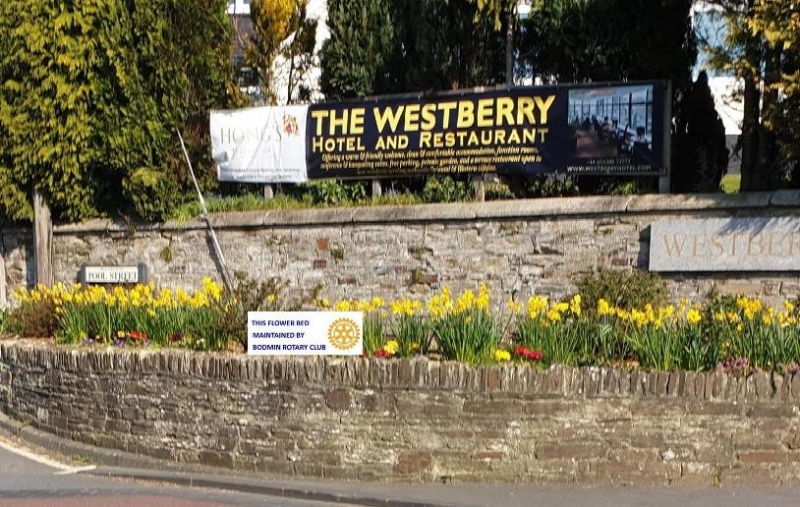 The Rotary Club of Bodmin has been active for 68 years and currently has 27 members representing a wide range of local business and professions - Brief Club History. Bodmin town is situated in Mid Cornwall embracing beautiful Countryside and Moorland within a short distance of the sea. 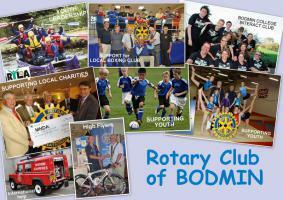 Join Bodmin Rotary Club - Select for more info. Members of Bodmin Rotary Club have been busy helping local voluntary groups keep the town tidy and attractive. 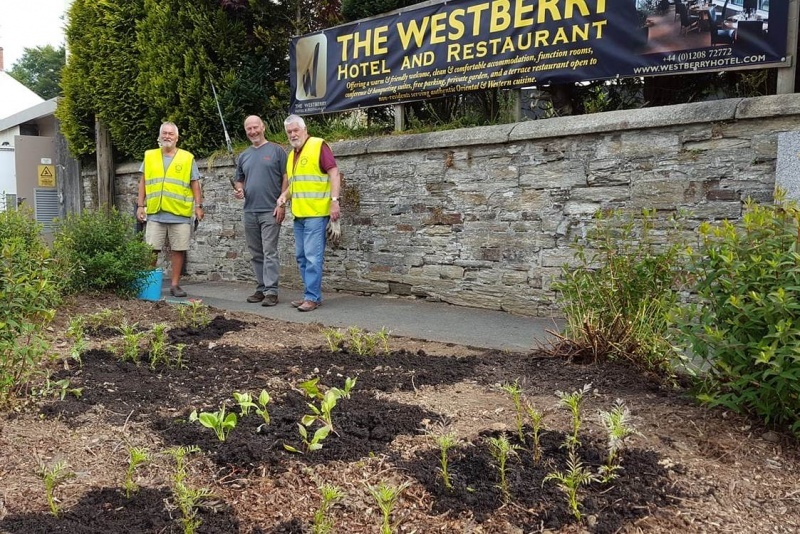 This Council owned flower bed is outside the Westberry Hotel, our meeting place every Wednesday evening has been adopted by the club. See below - Our gardening team. 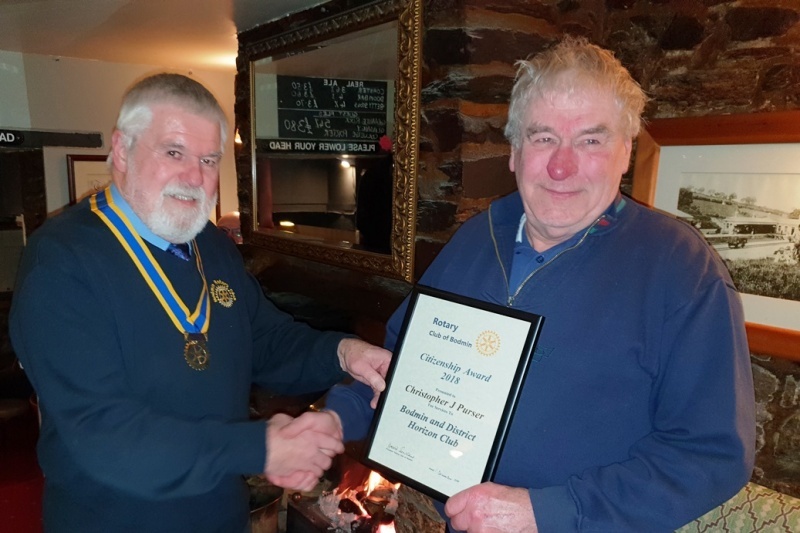 Bodmin Rotary Club recently made a local Citizenship award to Mr Chris Purser. Chris was selected because of his endless work in creating and running the Bodmin Horizon Club, over the past 10years. Photo: L to R David Jenkins (President Bodmin Rotary), Chris Purser. 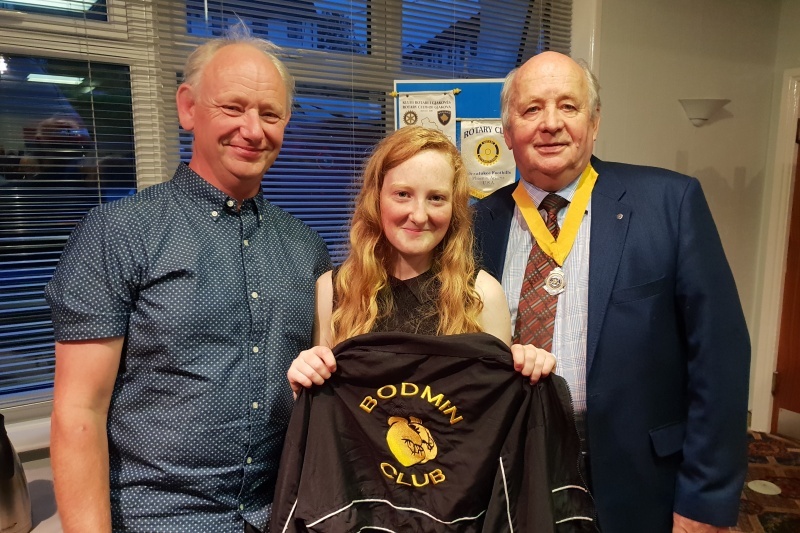 Bodmin Rotary support many local charities and organisations through-out the year and in the last month have supported and helped with the Joint Fireworks Event and the 'Battles Over' Final Tributes, Beacons of Light, which included illuminating the Beacon Monument. 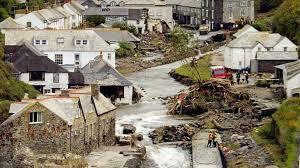 We will also be giving Christmas Gifts to many local persons, donating to the local Food Bank, donating to the local Memory Cafe and contributing to the cost of Bodmins Christmas Lighting. 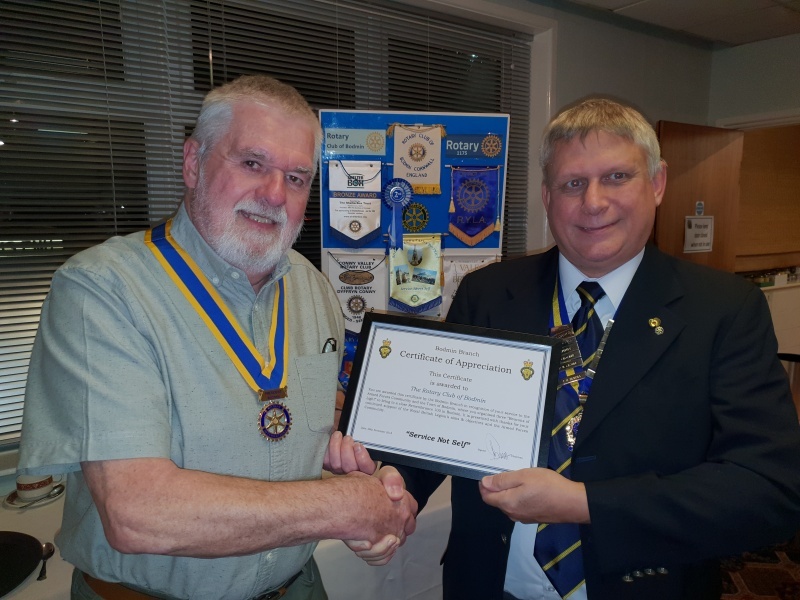 Certificate presented by the Bodmin Branch of the Royal British Legion in recognition for the 'Final Tribute' events organised on Sunday 11th Nov. 2018. Photo: L to R: David Jenkins (President Bodmin Rotary), Ian Trask (Chairman of Bodmin Branch Royal British Legion). A plea was received from the full time carers of 'Carol', who was disabled from a very young age, she lives in a very small flat and paints by holding a brush in her mouth. 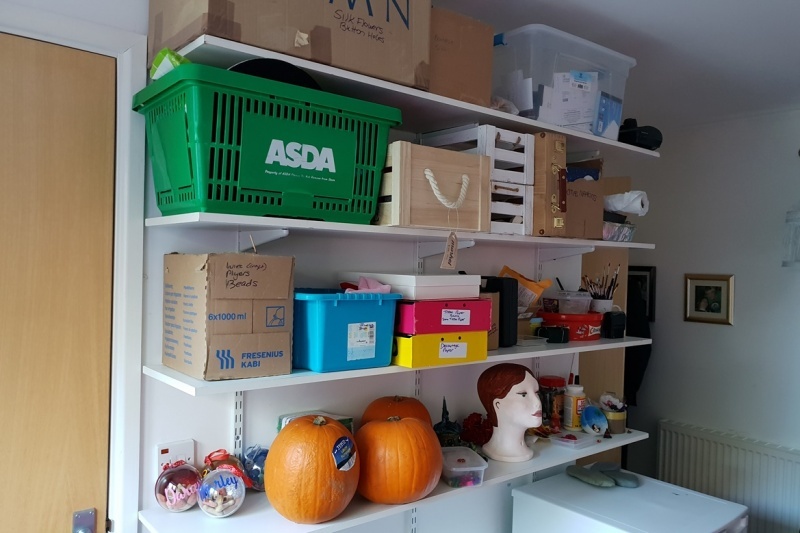 Help was required in providing storage shelves for Art equipment etc. as everything at the moment is kept in containers and boxes on the floor, which severely restricts wheelchair movement around the flat. Rotarian Peter Old quickly came up with the offer of some adjustable wall shelving and Neil Carter offered to apply his skills in fixing them to the wall. Peter and Neil went to the property and completed the job without delay; as can be seen in the photo below, expertly fitted, making good use of the wall space available and leaving much needed floor space free. Bodmin Rotarians - Ambassadors Extraordinaire. 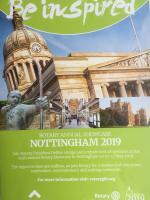 A group of four members from Bodmin Rotary Club - Peter Old, Peter Bray, Allan Foad and Peter Ford recently visited three Rotary Clubs in one day, all in different countries. Breakfast was in Wales (Cardiff Club), Lunch was in England (Clifton Bristol Club) and Drinks were in Ireland (Dublin Central Club) The challenge, the journey and the three clubs was an exciting experience and all three clubs were very different. 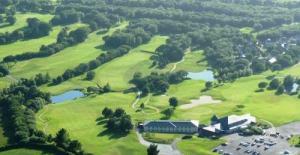 The Cardiff Club met for breakfast at 7.30 at the Cardiff Golf Club – the group were welcomed by the No1 President ( Three Presidents for the year each doing 4 months) and joined 24 members for breakfast and their meeting consisting of 50% women. The speaker was promoting the Cardiff City Hospice. The Clifton Club, Bristol met at the Clifton Tennis Club for Lunch, 34 members were attending, but they have no lady members. Following lunch the speaker, head of a local Junior School gave a talk about his schools involvement in supporting an African School. A member of Clifton Club then provided a taxi for the group to the airport. The aim, on arriving at Dublin airport at 5.30pm, was then by taxi, to get to the Dublin Central Club by 6.30pm for the start of their meeting. The flight being approx.. 30mins late meant that we arrived at the club at 6.45pm. We were welcomed and offered a seat and a glass of Water or Wine. Dublin Central Club was, to say the least, different ! They meet in an elegant room in the prestigious Hibernian Private Club in St. Stephens Square, Central Dublin. 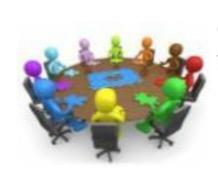 The club with approx.. 24 members, but only 11 were at the meeting were sitting around a central table with only a drink of wine or water, no meal is partaken – the hour long meeting is only to discuss Rotary business. Much of this meeting was taken in introductions by them and us. I was found that most of their members originate from many different parts of the world, Argentina, Hungary, Croatia, Canada, Spain, Turkey…. Their President was away so the Secretary took the meeting of approx.. 50% Ladies. One member Monica Robertson was the DG of Ireland (North & South) comprising approx.. 100 clubs. Some ways that we each raise funds was discussed, it was evident that Dublin were far more cash rich than Bodmin. (A Valentines Charity Ball with 350 attending raised over £20,000 for charity) The meeting was conducted very informally and only lasted the hour. 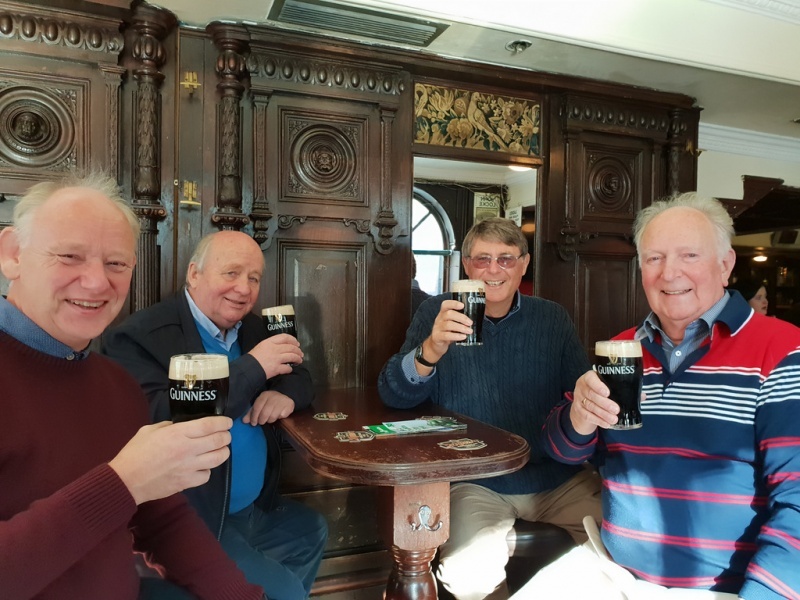 Having fulfilled their challenge of 3 countries in one day the group used the following day to explore Dublin and partake in some fine Jameson Whiskey and Guinness. This years RYLA candidate: Jessica Dorson (16 years of age) has recently returned from her one week course at the Dartmoor Youth Adventure Centre at Okehampton. 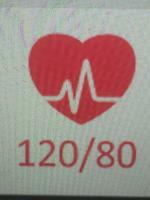 On Wednesday last, Jessica gave a very interesting and confident talk about all the activities she took part in. One very powerful message that Jessica impressed on us was the value of the course to her and everyone who attended. She says, in just one week, she feels a great difference in her confidence, in mixing with and talking to people, team work etc. It is one of the best things she has done and says many more young people should go on it if they can. Jessica is also an England Junior Boxing Champion. Money raised for MNDA - £8000.00 +. Cheque presented to Derek Williamson of MNDA by President of Bodmin Rotary Colin Marshall.